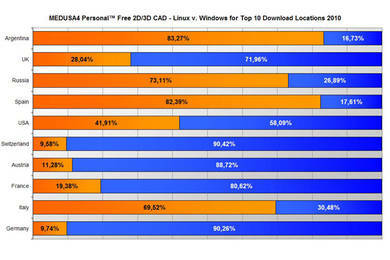 CAD Schroer’s MEDUSA4 Personal™ software is deployed in 165 countries, with 30% of users on Linux. Registrations at CAD Schroer’s eSERVICES portal for commercial users rose by over 450%. 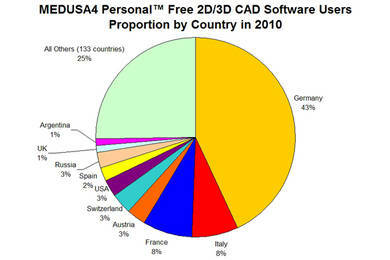 Cambridge, UK and Pittsford, NY – 6 April 2011: Between 2009 and 2010, downloads of MEDUSA4 Personal, the free version of the professional MEDUSA4 2D/3D CAD suite, deployed by companies worldwide, increased by 46%. The eSERVICES portal for pay-per-result commercial use marked a 450% rise in registrations. MEDUSA4 Personal, first released in 2006, is now deployed in 165 countries. Used by universities, students, DIY experts, model engineers and professional designers, the 2D/3D CAD system has been involved in the most diverse projects, from inventions, dissertations, patents and home designs to precision-engineered grandfather clocks and band logos. With much of the world still facing tough economic times, MEDUSA4 Personal – completely free for private use, with a pay-per-result model for commercial use – is ideal for self-employed design engineers. “Many CAD engineers starting a business come to us looking for the most cost-effective software for 2D/3D mechanical design, particularly for Linux,” says Michael Schroer. “At our eSERVICES portal, they can download MEDUSA4 Personal free of charge, only paying a small fee (from €2.99) to convert commercially viable results. That means no up-front costs, no risk, just a small charge that can be rolled into their project fees.” CAD Schroer releases regular updates to MEDUSA4 Personal, usually within just a few months of the latest commercial release. 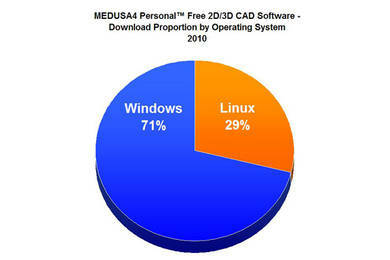 Around 30% of MEDUSA4 Personal users are on Linux, taking advantage of a powerful CAD system on a free platform. The software has been designed to run on CentOS, Fedora, RedHat, SuSE and Ubuntu – as well as supporting Windows XP, Vista and 7. The top ten countries of MEDUSA4 Personal users in 2010, and their approximate percentage of users on Linux were, beginning with the largest user base: Germany (10%), France (19%), Italy (70%), Switzerland (10%), Austria (11%), USA (42%), Russia (73%), Spain (83%), UK (28%) and Argentina (83%).